Annie Besant began her career as a political activist, working on issues such as suffrage, women's reproductive rights, and socialism. Along the way, she encountered the New Thought movement and developed a strong interest in spirituality. Within a few years, she had established herself as an international leader in the movement. 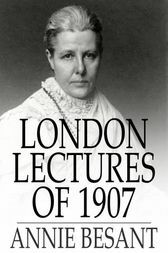 This volume collects a series of lectures on the subject that Besant presented in London in 1907.